A foreign body can be an eyelash, dirt, wood or metal, among other items, that get caught in the eye. Most people are alerted to a foreign body because the affected eye becomes red, irritated, watery or painful. Once a foreign body is in the eye, it causes the blood vessels of the eye to become red and the tissues of the eye to become irritated and swollen, which can possibly lead to an eye infection. Sometimes the injury can be serious enough to cause the material to pierce the eye. At times, it may be mild enough that the eye can tear it out on its own. 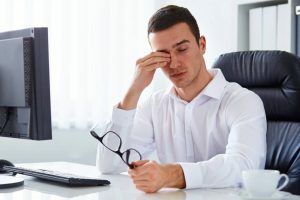 If you have something that is stuck in your eye for more than 1-2 hours, you should immediately call the office so you can come in and have it evaluated. You should not attempt to remove the foreign material yourself, since doing so may cause further damage to the delicate tissues of the eye. Depending on how superficial the foreign body is in the eye, it may be able to be removed with just rinsing the eye with saline or re-positioning of the eyelid. However, sometimes the object needs to be removed with a small metal instrument. This is done only after the eye is numbed first with eye drops to prevent any further pain. If you have any concern that there is a foreign body in your eye, please call our office and come in so we can take care of the foreign body and prevent possible future loss of vision or damage to the eye.